evolving collaboration | with Sociocracy 3.0, agile, lean, and lots of love. 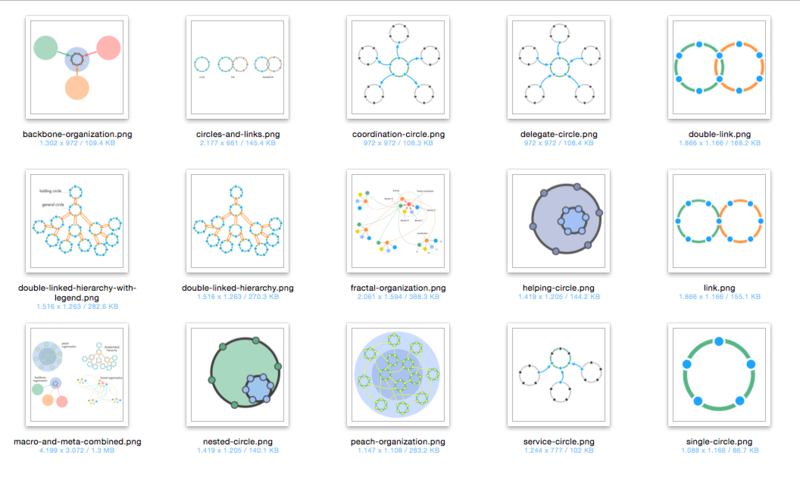 A slide deck with descriptions for each of the patterns in Sociocracy 3.0 via the S3 webiste. Am Dienstag, 15. November 2016, 10:00 – 18:00 Uhr, in Berlin. Der wesentliche Erfolgsfaktor für agile Unternehmen (und solche, die es werden wollen), sind Mitarbeiter, die entweder bereits ein agiles Mindset besitzen und danach handeln, oder sich zumindest in diese Richtung entwickeln, im Idealfall selbstmotiviert und selbstorganisiert. Einstellung und Entwicklung von Mitarbeitern wird jedoch in den meisten Unternehmen von HR-Abteilungen gesteuert, die selbst nicht agil arbeiten, die also – wenn überhaupt – nur theoretische Kenntnisse zum Thema Agilität besitzen. 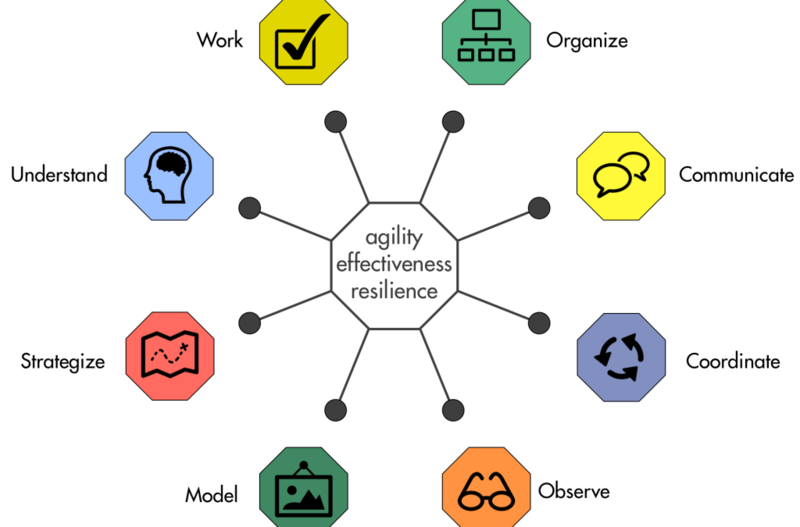 Und obwohl das Thema HR essentiell für agile Transitionen und für agile Unternehmen ist, beschäftigen sich die bekannten agilen Methoden und Vorgehensmodelle bisher nicht oder nur sehr oberflächlich damit. Sociocracy 3.0 (a.k.a. S3) ist ein offenes agiles Framework für alle Organisationsbereiche, das bereits einige konkrete Patterns für selbstorganisierte HR-Prozesse mitbringt. Dadurch wird es möglich, sich mit S3 dem Thema “agile HR” auf ganz unterschiedliche Arten zu nähern: so können agile Teams ihre HR-Prozesse einfach selbstorganisiert gestalten, Teams und HR können ihre Zusammenarbeit verändern, und HR-Teams oder -Abteilungen können selbst nach agilen Prinzipien arbeiten. S3 has evolved significantly since this page was published, and we could not catch up with the handbook, so for now I removed the download linkls. 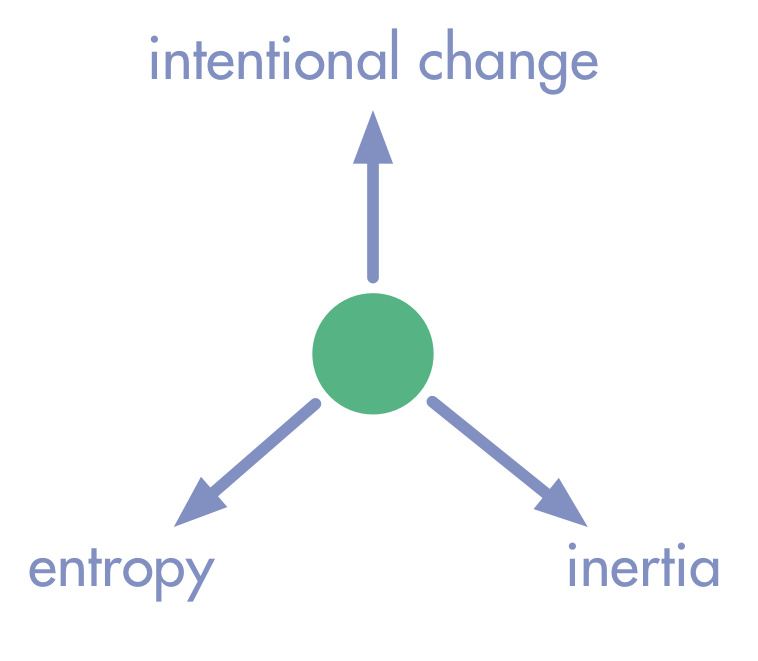 The latest version can be found in the slide deck “All Patterns explained” or on http://sociocracy30.org. Earlier this year I had compiled a handout for the participants of my workshops with descriptions of S3’s essential patterns. Over time, I updated the handout with the contents of the “All Patterns Explained” slide deck, several of my drafts for the upcoming book The Sociocracy 3.0 Handbook” I am writing together with James Priest, and other documents. Now grew beyond the scope of a handout, since it contains more than 100 pages, a section for each of the 65 patterns, an introduction and a changelog so you can see what’s new. 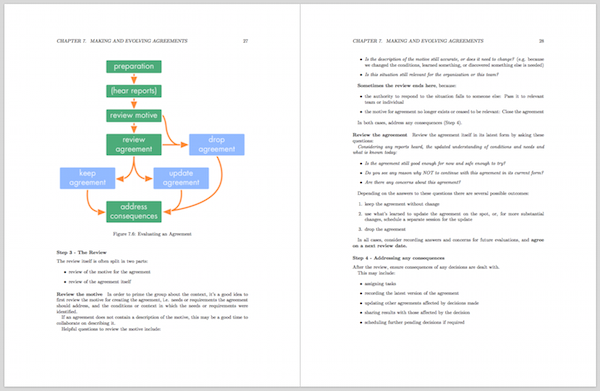 Until the “official” Sociocracy 3.0 handbook is ready, I will maintain this document as a beta version of the handbook and I will keep on updating it with more content and illustrations document, and include the “official” pattern descriptions as James and I finish them. 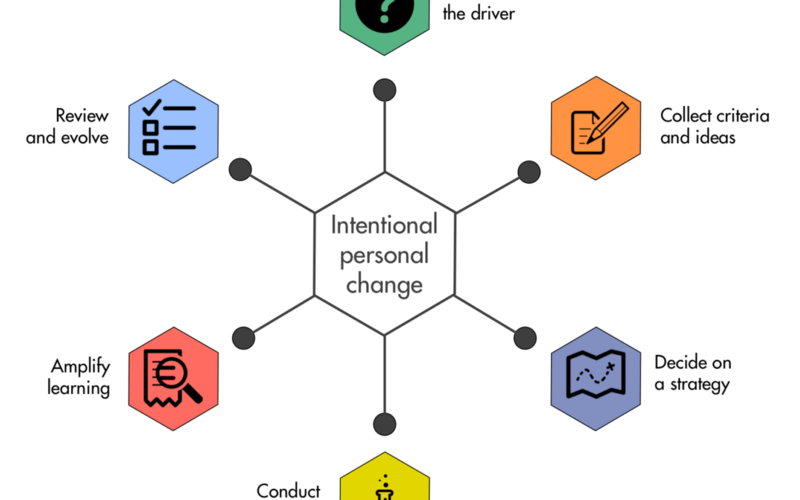 Over the past months, I have been experimenting with applying Sociocracy 3.0 (a.k.a. ’S3′) as a framework for personal development and as a method for guiding and documenting one-on-one coaching sessions. The result is an eBook called “S3 for One”, with a dedicated website at http://s3-for-one.com. Do you want to improve your communication skills, develop a healthier lifestyle, read more, love more, learn a new language, or get a new job? S3 for One provides you with a structured process to navigate intentional change in your life, be it just a small habit, a big change, a tricky decision or even the discovery of what you want to do with your life. 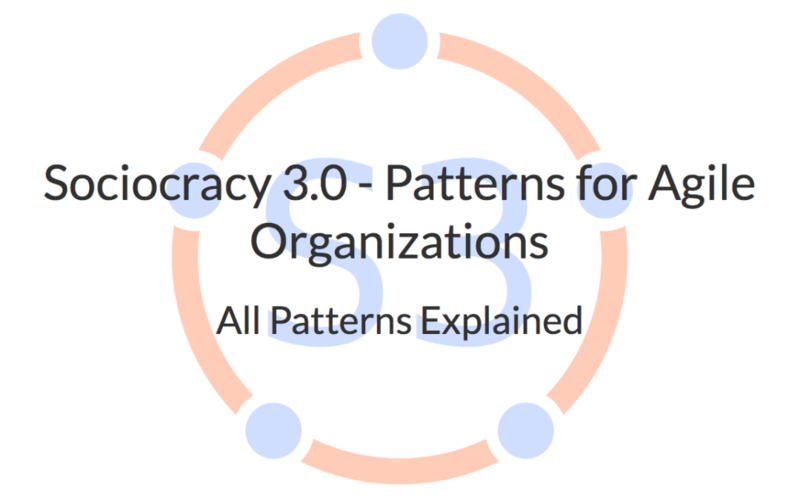 With more than 60 patterns, Sociocracy 3.0 has grown quite a bit in the past year. I have created the big picture to illustrate how it all fits together. As always, this is a work in progress, some patterns don’t have illustrations yet. A few days ago I had a workshop with Alexander Tornow and Volker Schad, where Alexander presented Stafford Beer’s Viable System Model (VSM), I explained S3, and then we discussed how S3’s patterns relate to systems 1-5 of VMS. I don’t claim to understand VSM in its entirety, and I must admit I remain unconvinced that an organization follows the same basic principles as the human body, but I think VMS is an interesting and useful model, at long as you don’t confuse the map with the territory. 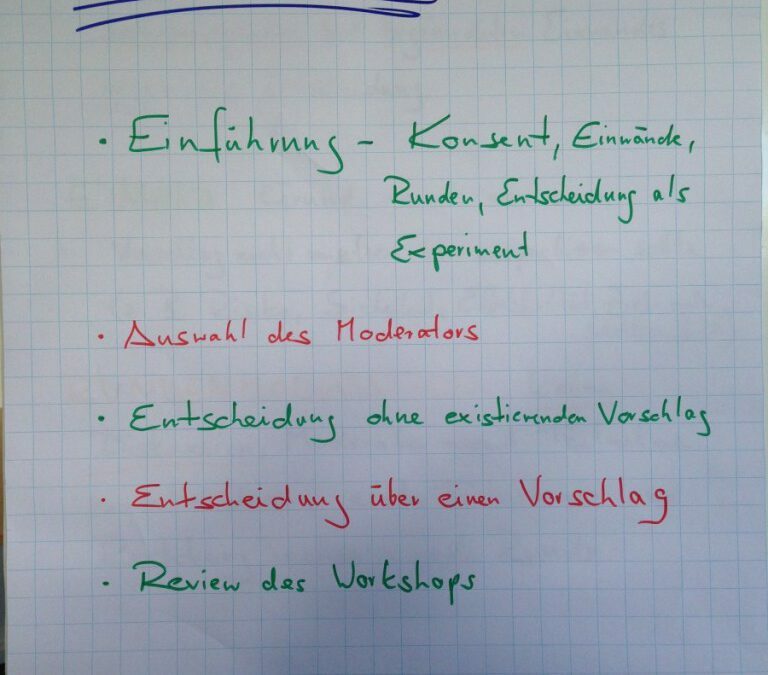 Für alle, die die Flipcharts nicht fotografiert haben, die Fotos als pdf zum Download oder unten zur Ansicht. Detailliertere Materialien dazu gibts auf sociocracy30.org. 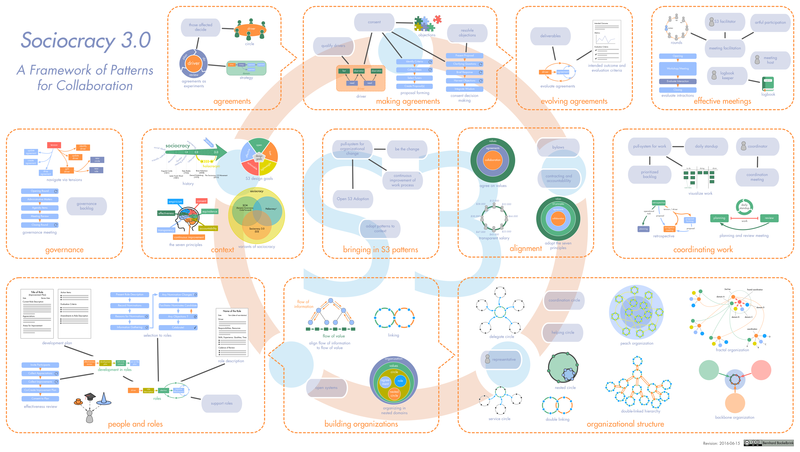 Many of the illustrations I have created for S3 are now available as high-resolution PNG files through GitHub and Dropbox. You can re-use them under a Creative Commons Attribution-ShareAlike 4.0 International License.